FinTech and RegTech solutions leveraging emerging technologies can make transactions faster, more secure, and efficient by standardizing global capital market systems. FinTech and RegTech solutions, which leverage emerging technologies such as distributed ledger technology (DLT), are witnessing rapid adoption in capital market functions across the globe. Until recently, capital markets were considered to be among the most traditional sectors within financial services. Therefore, an immense opportunity for disruption exists. Inconsistent risk assessment and compliance. Emerging technologies can help make transactions faster, more secure, and efficient by standardizing global capital market systems. Capital market firms are coming to realize that DLT, often referred to as blockchain, can help eliminate the need for intermediaries. These intermediaries handle system-information flows that provide settlement and deposit functions. 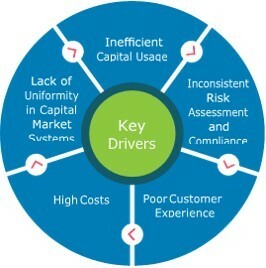 Such tasks are prone to reconciliation errors, settlement delays, and data duplication that triggers inefficient capital usage and erroneous risk assessment. DLT is a logical, efficient alternative to allow seamless and secure data transmission throughout the capital market ecosystem. In parallel, RegTech firms are using emerging technologies to transform the compliance function while easing risk management and surveillance challenges. Globally, capital markets generate and consume vast quantities of high-quality market data, which when processed by advanced analytical tools, can uncover insights that may not have been humanly possible. With unstructured data being generated on social and professional networks and platforms around the world, there is great value to be gained by moving from structured to unstructured data analysis, and, incorporating the resultant insights into financial models and trading strategies. FinTechs are introducing solutions that align globally with common standards and help to reduce project implementation costs and complexities by eliminating the need for multiple intermediaries. For example, London-based FinTech startup EquiChain launched a blockchain prototype for capital markets that allows direct interaction and exchange of value between market participants, doing away with multiple touch points and inefficiencies. By using DLT, capital markets would not require data normalization, reconciliation of internal systems, or agreement on exposures and obligations. The industry would run on standardized processes and services, shared reference data, near real-time data, and better risk assessment. This would enable capital markets firms to enhance the customer experience and help them to function more efficiently. Given the decentralized nature of DLT platforms, regulatory supervision would be less complicated as asset holdings would be transparent across the system leading to low chances of fraud. DLT may also enable developing markets to more quickly transition to systems with greater liquidity, ease of access, and security because they would leapfrog the evolutionary cycle of current systems. In the not-too-distant future, incumbent firms may be making regular use of emerging technologies such as artificial intelligence and machine learning to create robust, efficient, and standardized operating models. Find out more in Top-10 Trends in Commercial Banking 2018, a report from Capgemini Financial Services. Combining parts of the words “regulatory technology,” RegTech addresses regulatory challenges in the financial services sector through innovative technology. RegTech firms use technology to help businesses comply with government regulations efficiently and cost-effectively. FinTech Innovation, “EquiChain to launch DLT platform for capital market,” March 13, 2017, https://tinyurl.com/ycy682es, Accessed July 2018.